On the 19th May 2010, Lennox, then a five year old American Bull dog Labrador cross was wrongfully seized by Belfast City Council Dog Wardens from his loving family home where he lived with his owners and his kennel mates. Lennox committed no crime nor did any member of the public complain about him. Three Belfast City Council Dog Wardens came with the PSNI to his home unannounced. The Dog Wardens then told the Police to leave as there was no need for them at the location. The Belfast City Council Dog Wardens then had tea with his owners, chatted, played with the other family dogs after which the Dog Wardens then measured Lennox’s muzzle and rear legs with a worn dress maker’s tape measure and decided on those measurements without seeking any professional advice that he was possible “Pit Bull Type Breed” and so he was led from his home to be put to death by the Council. During Lennox’s legal battle he did achieve many things some of which inlcude the saving of many other dogs facing death at the hands of BSL and most notably Lennox’s case caused Northern Ireland’s devolved government based at Stormont to introduce the dog exemption scheme in line with that of mainland UK, although the exemption scheme isn’t perfect it does however allow many dogs like Lennox to return home to their loving families and to date many innocent dogs have returned since the introduction of Northern Ireland’s exemption scheme. Northern Ireland has yet to fully implement the same dog legislation as mainland UK. The USPCA said the law in Northern Ireland could be changed simply and rather quickly by an order in Council however USPCA remained silent throughout Lennox’s case even when they had been provided pictures of his cruel treatment and his condition. Lennox’s family had done more than required by the law as responsible dog owners who also foster dogs for various Northern Ireland dog shelters. When Lennox was a puppy his owners had him neutered, licensed, insured, DNA registered, Pet Safe registered and micro chipped and Belfast City Council had issued a dog licence for Lennox for the last seven years and even took money and issued dog license’s for Lennox while he was in the Belfast City Council’s so called “care” for the last two year’s of his life. On the day Lennox was taken from his family home the Belfast City Council issued his owner with a warrant of seizure which was incorrectly addressed and was for another location, furthermore the Council used the ADBA Inc (American Dog Breeders Association Incorporated) breed standards guide to help identify Lennox as possible Pit Bull type. It has now become clear that the Council used this ADBA breed standards guide illegally breaking international and Berne copyright laws as Belfast City Council have never been authorised by the ADBA to use the copyrighted breed standards guide in full or derived version and due to Lennox’s seizure the ADBA have issued the Belfast City Council with ‘Cease & Desist’ orders due to the Council’s unauthorised and continued use of ADBA material. Lennox’s owners have only been contacted once by the Belfast City Council to date and this was two hours after Lennox had been taken. One of the Dog Wardens who seized Lennox telephoned Lennox’s owner to say “If you do not sign him over to us to be destroyed then you will most certainly lose your job as we will force a prosecution upon you through the courts.” On many occasions the family have telephoned the Council’s Dog Control Manager but to date the Manager has never taken the families call or returned any calls. Lennox’s family have never been told where he was held for the last two years of his life, although it is in the public domain and public knowledge that the kennel’s contracted by Belfast City Council are Corran Kennel’s. The family were refused the right to see Lennox’s body clearly to hide the condition he was in at time of death, what type of care, feeding or regular exercise he had received, if any. Lennox’s family had repeatedly requested visitation to see what condition he was in during his days with Belfast City Council however the Dog Control Manager for Belfast City Council Dog Wardens Department had continually refused all requests through the families Solicitor. Photographs of Lennox emerged during his stay with the Council’s contracted kennel and had been passed to the family which clearly show Lennox in a cold inhumane concrete kennel which is visibly too small, there are no visible signs of a constant fresh water supply, heating, toys for stimulation and the photographs show Lennox sitting upright in a box type bed surrounded by his own faeces with only saw dust for bedding which many dog experts have agreed is harmful to dogs and unsuitable for bedding, yet Belfast City Council Dog Wardens Department have stated they practice humane animal welfare as set out by the DARD (Department of Agriculture and Rural Development). After studying the Animal Welfare Act 2006 it is clear that none of Lennox’s welfare needs were being met at this undisclosed Council contracted kennel. Local leading MP’s including Northern Ireland’s First Minister joined in support of Lennox stating in the Belfast Telegraph and other media they were “Appalled” by the seizure and treatment of Lennox and his family. A global campaign which boasts millions of supporters and several hundred thousand petition signatures had begun in support of Lennox’s freedom. The ADBA Inc, various Animal Rights groups, Animal Welfare organisations, Veterinarians, Dog Breed Behaviorist Experts and many celebrities had all gave their support for Lennox’s freedom and many supporters who are regular tourists to Northern Ireland have went further by stating they will not return to Northern Ireland due to Lennox’s cruel unnecessary death at the hand’s of Belfast City Council and their contracted kennel. The most heartfelt plea of all was heard from Brooke, the owner’s Daughter who is registered disabled. Lennox grew up around Brooke and the two became inseparable. Due to Brooke’s illness she is unable to play each day with other children and so found Lennox to always be there as a playmate and someone to be of comfort to her. Since her best friend was taken Brooke has missed much School due to suffering health and unneeded stress caused by missing her dog. Brooke’s specialist Doctor at Belfast Royal Hospital for Sick Children has also expressed growing concern for the child’s separation from her pet. We ask for your help to stop the incarceration of innocent family pet dogs, we all have a role to play in ending BSL around the globe and stopping organisations like Belfast City Council abusing their power enabling them to punish families who speak out against them. If you have any compassion you will clearly see that far too many wrongs and errors were made by the Council in the seizure of this much loved family pet. You will see how the Council involved are attempting to cover up what they have done and also trying very hard to silence anyone who speaks out against them. 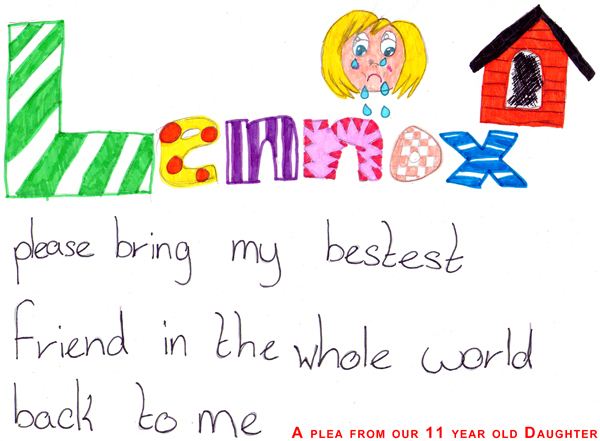 Be part of the Lennox campaign and help change things, don’t let Lennox’s life have been in vain.